Pictures can be deceiving—this bike is actually gold-plated. 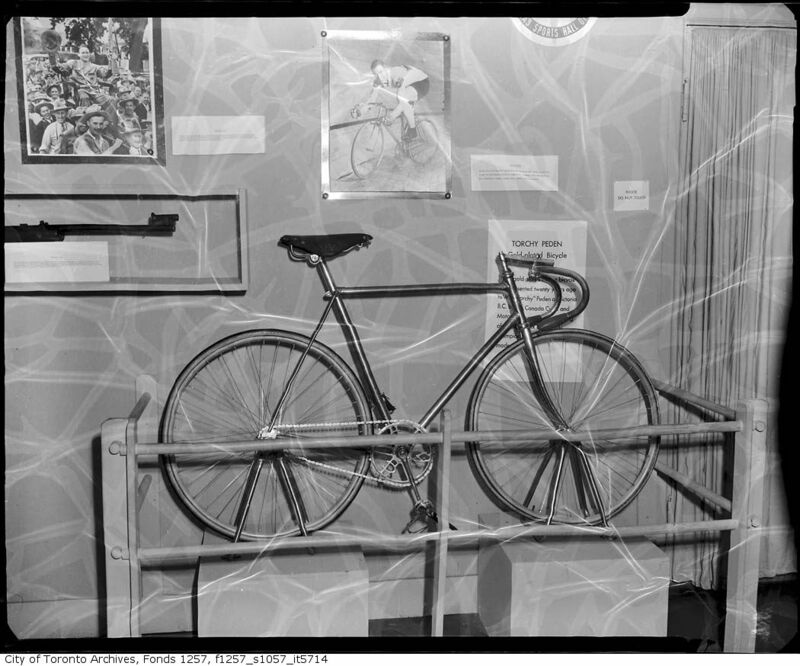 This sumptuous bike was presented to William “Torchy” Peden in 1959 at the Canadian Sports Hall of Fame. Born in Victoria B.C. in 1906, Peden was arguably Canada’s best cyclist. As a professional bicycle racer he joined the Six-Day racing circuit, winning 24 of 48 races he entered in his first year. As well, he set a world speed record in 1929 riding his bike at 130 km/h. This stood until 1942. He died in Chicago in 1980, and was ranked third, posthumously, in Canadian Cyclist Top 100 of the 20th Century behind Steve Bauer and Allison Sydor. Read more about Peden here.